More than two dozen public stairways cross the hillsides of Echo Park, concrete reminders of a neighborhood designed before the automobile became the dominate form of transportation. Many are small and practical in scale, rising only a few steps to provide a quick short cut to the next street or a secluded corner reachable only by stairs. But some, including the Laveta Terrace, Baxter and Clinton Stairs, are impressive and stylish public landmarks that reward those who climb them with stunning views. In fact, at more than 230 steps, the Baxter Steps are perhaps the tallest in the city. While some stairs are rarely used, many of the public walkways provide the only access to the homes located along the steps and are of critical importance to numerous residents. 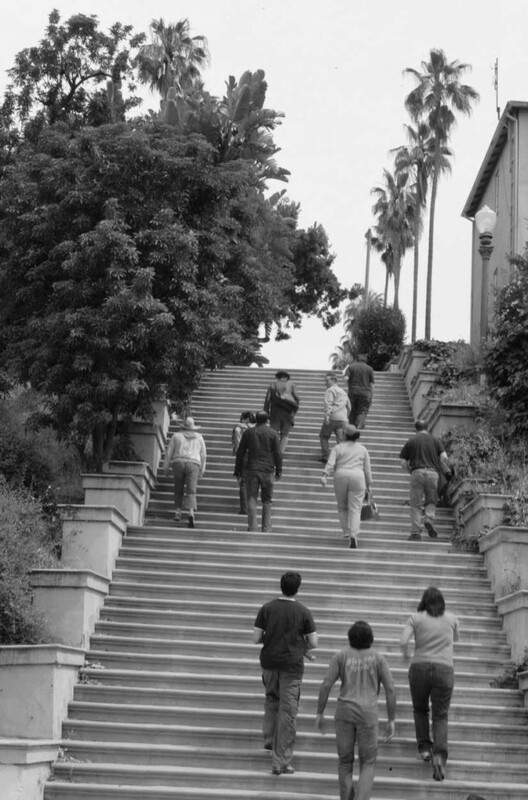 The practical need and purpose of the stairways is obvious given Echo Park’s hilly topography. But the historic details of the stairways—why some are grand and others utilitarian—and who determined their location remains a mystery for the most part. Based on some research of city records, the first stairways—made of wood–began appearing in Echo Park in the 1890s—long before most streets were paved and the automobile became popular. Some were built by private developers, others were partnerships between the city and private interests, including the passenger railroads and trolley systems. Some of the stairs are simply extensions of a street right of way in locations where steep hillsides made them necessary. When you add all these bits and pieces of information, one can assume that the stairs were part of a transportation system that made it possible for year-around residential development of Echo Park and other neighborhoods of the same era. Stairs would have made it feasible for the residents of many hillside tracts to easily walk down to the rail lines—including those on Echo Park Avenue and what is now Glendale Boulevard—that transported them to work and shopping in downtown Los Angeles, Hollywood and other locales. Many of the original wooden stairways have been replaced by concrete steps over the decades. The last remaining wooden stairway in Echo Park are located just east of Allesandro on Oak Glen street. Climbing the more than 230 steps will leave you in awe or in cardiac arrest. The top of the stairs is across the street from Elysian Park and its many walking trails. Located on Baxter Street, three blocks east of Echo Park Ave.
A wide, elegant stairway with multiple landings that leads to a row of palm trees at the top of the hill. Located on Laveta Terrace, one block east of Echo Park Ave., north of Sunset Blvd. Twin, stairways zig-zag up the bluffs to the west of Echo Park Lake. Though the stairs are often marred with tagging and graffiti, the climb to the top offers the best view of the lake and, on a clear day, the mountains and hills to the north. Located on Glendale Boulevard, north of the 101 Freeway. This shady stairway is often clogged with leaves but it offers glimpses of some charming cottages and gardens located along its steps. Located on Curran Street, one block east of Echo Park Ave.
Avalon Stairways. Here are two stairs that extend east and west off Echo Park Ave. at Avalon St. The western steps go up a narrow but well maintained stairway that runs along some restored homes and cottages. The eastern steps are of the no-frills variety but they switch back numerous times and at various angles up a steep hillside. Delta & Lucretia Stairways: The Delta stairways take you past a jungle of giant agaves and up a hillside with some cute cottages, homes and canyon views. At the top of the hill, turn left and you will soon go down the narrow steps leading off Lucretia Avenue and through another tangle of plant life and glimpses of interesting, hillside homes. Located on Delta St., one block west of Echo Park Ave.